In this tutorial, we will learn about how to use Hibernate to perform CRUD operations on database. This example will make use of standard JPA annotations. Let’s get going. Post Creating a maven project with command line contains step-by-step instruction to create a maven project with command line and importing to eclipse. Now let’s add/update the content mentioned in above project structure. Model class Student is a simple POJO class which is annotated with JPA annotations to map it to a database table(created is step 1). Above class uses standard JPA annotations. @Entity marks this class as Entity Bean. @Table declares on which database Table this class will be mapped to.You can also specify other attributes like catalog and schema along with name. Note that @Table annotation is optional and in absence of this annotation, unqualified class name is used as table name in database. @Id marks the field(or group of fields) as primary key of entity. Optionally, you can also specify how the primary key should be generated.This depends on the underlying database as well. For example, on MySQL ,IDENTITY is supported (strategy = GenerationType.IDENTITY) but not on Oracle. On the other hand Oracle supports sequence (strategy = GenerationType.SEQUENCE) but MySQL doesn’t. 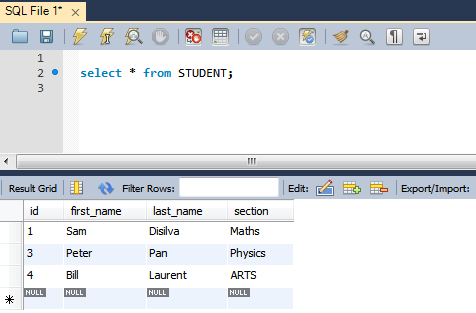 @Column maps the class field to column name in database table.This too is optional and if not specified , field name will be used as column name.It You can specify other attributes including unique, nullable, name & length. Finally, it’s a good practice to override hashcode and equals method. It becomes even mandatory when working with collections or detached instances. Hibernate manual contains a detailed description about them. dialect property informs hibernate to generate database specific (MySQL here) instructions. driver_class defines the database specific driver hibernate will use to make connection. next 3 properties corresponds to database connection. show_sql will instruct hibernate to log all the statements on console and format_sql instructs it to display properly formatted sql. 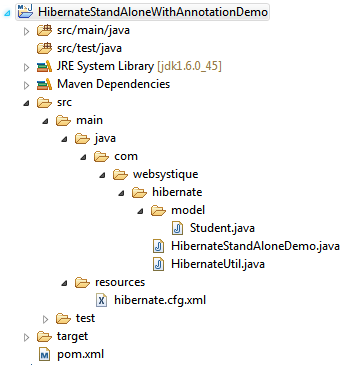 mapping tag instructs hibernate to perform mapping for classes refereed by class attribute. We will be using same pattern in our run class. Create a main class with below mentioned content and run it. This class will save few records, list all of the persisted records from database, update a specific record in database and finally delete a specific record in database. //session.update(student);//No need to update manually as it will be updated automatically on transaction close. Hibernate: select student0_.id as id1_0_0_, student0_.FIRST_NAME as FIRST_NA2_0_0_, student0_.LAST_NAME as LAST_NAM3_0_0_, student0_.SECTION as SECTION4_0_0_ from STUDENT student0_ where student0_.id=? Hibernate: update STUDENT set FIRST_NAME=?, LAST_NAME=?, SECTION=? where id=?